I’ve always struggled with finding the time (and the desire) to eat a balanced breakfast in the morning, and despite me constantly telling my kids that breakfast is the most important meal of the day, it is definitely a case of do as I say, and not as I do! The worst thing is that on the days I miss breakfast, I find that my whole day gets derailed, since I am usually starving by mid-morning, and then make poor choices for the rest of the day. 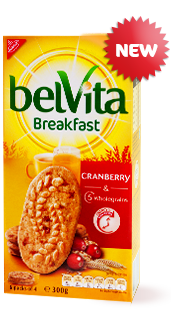 So I was thrilled when Nuffnang offered me a chance to try the new BelVita Cranberry breakfast biscuit. I am pretty sure that BelVita came out a little while ago (I am vaguely aware of seeing ads for them), but because they are found in the biscuit aisle, I never came across them. The cranberry version I was sent is a new variant and it is delicious! And really, is there anything more delightful than starting your day with a biscuit? 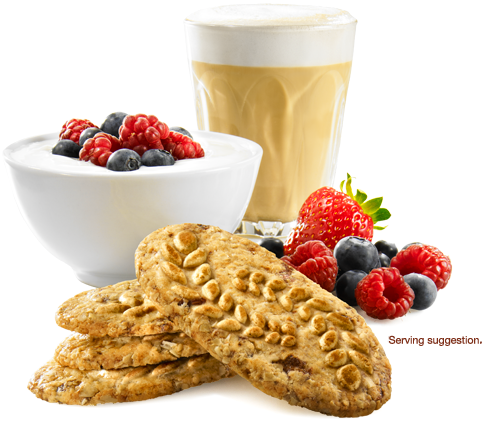 Filled with 5 wholegrains (nearly half of your daily recommendation), fibre and with a low GI, these biscuits, together with a homemade latte in my reusable takeaway cup and a piece of fruit, add up to a balanced breakfast that I can eat and drink on the go, and that keeps me going until lunchtime. Since trying the cranberry variety, which was delicious and fruity, I went out and purchased the other flavours as well. Fruit and Fibre was my next favourite and hubby’s first choice, with the fruit adding a hint of chewiness, while the Honey Nut Choc Chip was the kids’ choice (no surprise there!). While I still insist on my kids having a sit-down breakfast, these BelVita breakfast biscuits offer me a convenient breakfast without compromising on taste or nutrition. Disclaimer: this is not a sponsored post and no compensation was given to me. One packet of BelVita biscuits was provided to me for review purposes through Product Talk by Nuffnang. All opinions expressed are my own.